Electrical systems maintenance helps protect workers, avoid equipment downtime, and reduce the cost of repairs. In fact, proper maintenance is absolutely essential to the safety of your facility and your employees. Get guidance you can trust in NFPA 70B, Recommended Practice for Electrical Equipment Maintenance. NFPA 70B details preventive maintenance for electrical, electronic, and communication systems and equipment -- such as those used in industrial plants, institutional and commercial buildings, and large multi-family residential complexes. Used alongside the requirements in NFPA 70E®, Standard for Electrical Safety in the Workplace® NFPA 70B helps facility managers develop and carry out an effective Electrical Preventive Maintenance (EPM) program for all types of equipment and assemblies. 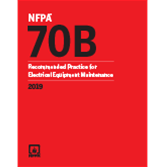 Contractors look to NFPA 70B for information about properly servicing equipment, and designers depend on it for developing specifications for installation that take maintenance into account. Updates in NFPA 70B coordinate with NFPA 70E and the "dot" standards from the Institute of Electrical and Electronics Engineers (IEEE). New recommendations for performing a maintenance-related design study correlate with the latest edition of NFPA 70E. New references help you identify content covered in approximately 70 IEEE "dot" standards in the IEEE 3000 Standards Collection™, replacing references to the IEEE Color Books. 2.4 References for Extracts in Recommendations Sections. 4.2 Value and Benefits of a Properly Administered EPM Program. 4.3 EPM and Energy Conservation. Chapter 5 What Is an Effective Electrical Preventive Maintenance (EPM) Program? 5.2 Essential Elements of an EPM Program. 5.3 Planning an EPM Program. 6.2 Survey of Electrical Installation. 6.3 Identification of Critical Equipment. 6.4 Establishment of a Systematic Program. 6.6 Maintenance of Imported Electrical Equipment. 6.7 Maintenance of Electrical Equipment for Use in Hazardous (Classified) Locations. 6.8 Outsourcing of Electrical Equipment Maintenance. 6.9 Emergency Preparedness and Electrical System and Equipment Restoration (EPnSR). 6.10 Counterfeit Components, Devices, Tools, and Equipment. 7.2 Grounding of Equipment to Provide Protection for Electrical Maintenance Personnel. 8.1 Design to Accommodate Maintenance. 8.6 Guidelines and Impact of Additions/Rework to Retrofitting Equipment. 8.8 Special Handling and Disposal Considerations. 8.9 Supervisory Control and Data Acquisition (SCADA) Systems. 8.11 Threaded Connections and Terminations. 10.4 Voltage Sags and Swells. 10.5 Long-Duration Undervoltages and Sustained Voltage Interruptions. 10.6 Unbalanced Voltages and Single Phasing. 10.8 Noise in Electrical and Electronic Systems. 10.10 Voltage Fluctuations and Flicker. 11.2 Acceptance Tests and Maintenance Tests. 11.3 As-Found and As-Left Tests. 11.5 Special Precautions and Safety. 11.6 Qualifications of Test Operators. 11.16 Medium and High Voltage Circuit Breakers. 11.23 Switchgear and Switchboard Assemblies. 11.25 Power Factor Correction Capacitors. 11.27 Test or Calibration Decal System. 12.2 General Aspects of Maintaining Medium- and Low-Voltage Distribution Systems. 12.4 Process Instrumentation and Control. 13.2 Ground-Fault Protective Equipment for Excessive Leakage Currents. 13.3 Ground-Fault Protective Equipment to Prevent Damage. 14.2 Symptoms and Causes of Inadequate Grounding. 14.3 Grounding System Inspection, Testing, and Monitoring. 14.4 Solutions to Inadequate Grounding. 15.8 Gas-Insulated Substations and Gas-Insulated Equipment. 16.2 Components and Maintenance of Motor Controls. 16.4 Bus Bar, Wiring, and Terminal Connections. 16.9 Motor Overload Relays — Thermal Types. 16.10 Pilot and Miscellaneous Control Devices. 17.5 Types of Insulated-Case/Molded-Case Circuit Breakers. 18.1 Fuses Rated 1000 Volts or Less. 18.2 Fuses Rated over 1000 Volts. 19.2 Visual and Mechanical Inspection. 19.6 Inspection and Testing Records. 24.8 Pin and Sleeve Devices. 25.3 Stator and Rotor Windings. 25.4 Brushes, Collector Rings, and Commutators. 25.6 Cleaning and Drying Insulation Structures. 25.10 Energy Efficiency of Motors. 26.6 Assembly and Installation Guidelines. 27.2 Maintenance of Electrical Equipment for Use in Hazardous (Classified) Locations. 28.2 Types of UPS Systems. 28.3 UPS System Maintenance Procedures — General. 29.4 Cord and Attachment Plug Care. 30.2 Operations and Maintenance (O&M) Documentation. 31.5 Developing of Functional Performance Tests (FPTs). 33.2 Maintenance of the Photovoltaic System. 34.2 Maintenance of the Electric Vehicle Charging Stations. 35.7 Supervisory Control and Data Acquisition System (SCADA). 35.10 Cable Support Systems, Cables, and Terminations. 35.11 Collector Substations and Switchgear. Equipment maintenance impacts safety, downtime, and the cost of repairs. NFPA 70B works hand-in-hand with NFPA 70E® to help protect your personnel, your facility, and your business! Electrical systems are the lifeblood of your work, and proper maintenance is essential to the safety of your facility and your employees. Get guidance you can trust in NFPA 70B, Recommended Practice for Electrical Equipment Maintenance. Used alongside the requirements in NFPA 70E®, Standard for Electrical Safety in the Workplace®, NFPA 70B helps facility managers develop and carry out an effective Electrical Preventive Maintenance (EPM) program for all types of equipment and assemblies. Contractors look to NFPA 70B for information about properly servicing equipment, and designers depend on it for developing specifications for installation that take maintenance into account. Changes in the 2016 edition help you guard against electrical incidents and system failures. Loose connections are a significant contributor to maintenance issues. That's why the 2016 edition of NFPA 70B includes new torque requirements that help minimize risks related to poor connections, which have the potential to cause overheating, intermittent open circuits, and electrical arcs. In another change, enhanced battery testing and maintenance requirements provide greater detail about battery testing and safety considerations for anyone performing battery maintenance. Batteries are part of many electrical systems and some are critical to power systems involved in life safety. Interested in other editions of NFPA 70B? Use the drop down menu above to select the edition year you need.